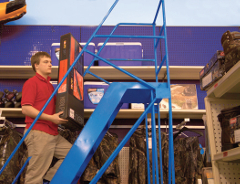 An employee lost her balance and fell from an eight-foot stepladder while stocking shelves. As she was reaching to rearrange the stock, she struck her knee on the shelf and fell, suffering injuries to her back, neck and head. An employee suffered multiple injuries while installing decking. The worker wasn’t wearing any kind of fall protection, and fell five metres to a concrete floor below. This person now uses a wheelchair. An employee died after losing his balance and falling 30 metres from a suspended work platform. The victim was wearing a harness and lanyard, but hadn’t tied it into the fall-arresting system. 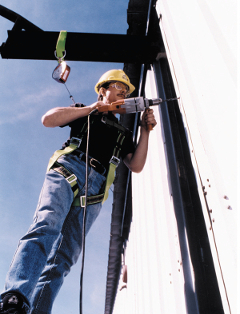 Many workers are killed or sustain serious injuries when working at heights. These injuries are often easily preventable, and happen because of a lack of planning or training, or the use of inappropriate equipment. First: The safest choice is to use guardrails or a travel restraint system. Guardrails remove the risk of falling by putting a barrier between workers and the edge. Travel restraint systems are designed to prevent employees from reaching an unguarded edge or opening. Second: Fall-restricting systems combine work positioning and fall-restricting equipment to limit a person’s fall distance. The use of this fall protection system is limited to wood poles. Third: Fall-arresting systems stop workers from hitting the surface below once they’ve fallen. Note: Although the system will keep employees from striking the surface below, workers can still suffer injuries from falling into the system, and by remaining suspended until they are rescued. The one-person anchor, and the structure to which it is attached, must be able to withstand 22 kN, equivalent to the weight of a mid-size car. An employee who has fallen must be rescued quickly, so a rescue plan must be developed in advance. Fall-arrest equipment must be removed from service and inspected by a competent person before it’s returned to service. Although not required in all circumstances, an energy absorber is highly recommended with fall-arresting systems. They significantly decrease the physical impact sustained by workers after they’ve fallen. Last: The control zone is an area between the warning line and the unguarded edge. Where an employee is required to work within the control zone, the use of another fall protection system is required. In New Brunswick, the law on fall protection can be found under sections in Regulation 91-191 of the Occupational Health and Safety Act.